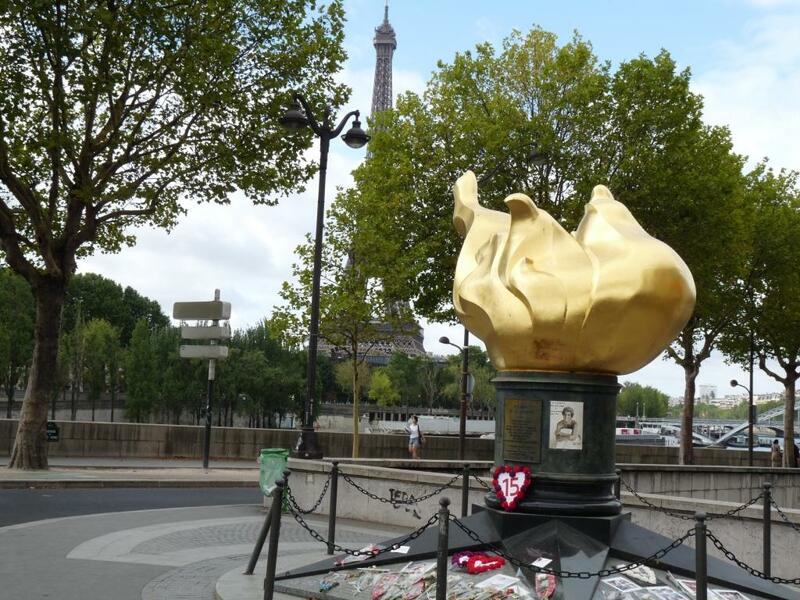 “I Think One of the Japanese Guys Wants to Go Water Skiing.” D wanted to visit the Liberty Flame, a replica of the Statue of Liberty flame that was given to the city of Paris by the International Herald Tribune to mark its 100th anniversary. The flame became the site of an impromptu memorial to Princess Diana when she died in 1997 in a nearby tunnel. We were there one day before the 15th anniversary of her death. 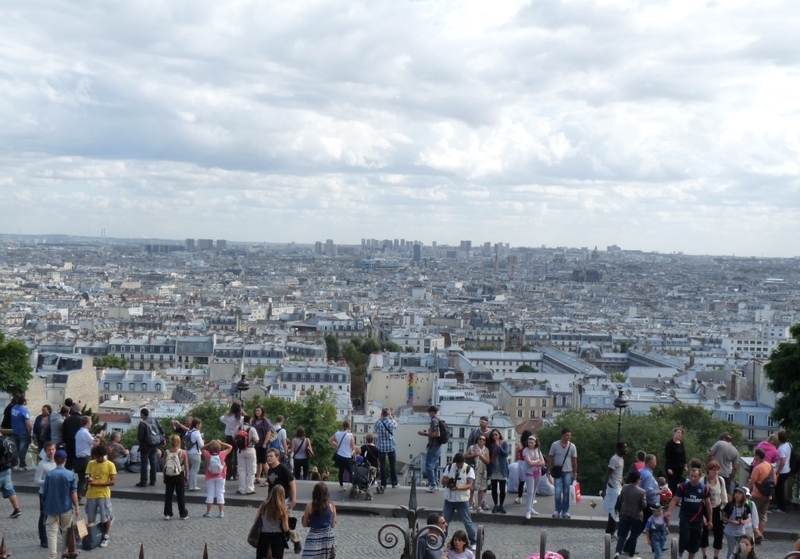 The skies were getting cloudy and we were wondering what to do, when D spotted the docking point for the Bateaux Mouches, the tourist boats that ply the Seine. We figured that if it did indeed rain, that we could just go from the upper deck to under cover. We just made it to a boat that was leaving and headed to the top. There, we were amongst tourists from all over, but mostly the Middle East, Japan and China. There were a few Brits but I didn’t hear any other Americans, which may have been the only time that happened during any of our sightseeing. The tower is kind of hard to miss. 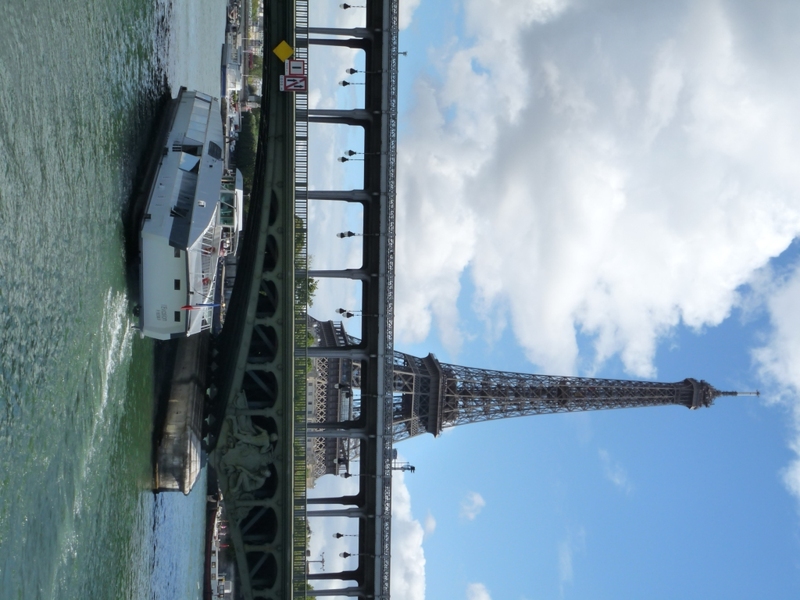 To see more photos from the Bateau Mouche trip, click here: https://skydrive.live.com/redir?resid=FCB2CF114ECC39C7!5934. “No Photos, Please.” The weather was still looking iffy, so a museum sounded like a good idea. 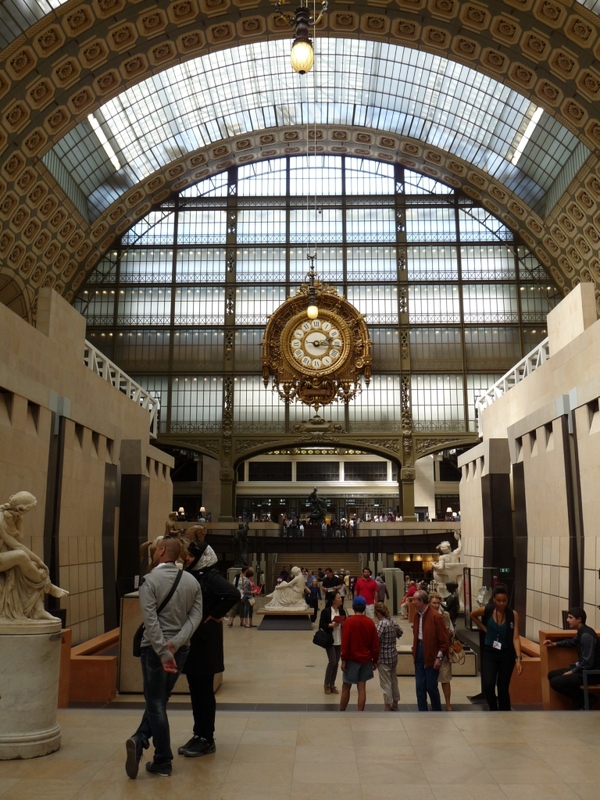 We headed to Musee d’Orsay, renowned for its Impressionist gallery. When you walk in, you’re greeted by signs telling you no cell phones and no cameras. But it appeared that people were allowed to take photos in the cafeteria and there was an outdoor balcony with pretty views. I’m guessing they don’t sell hot dogs and nachos. The young lady on the right with the lanyard is coming to tell me, ‘No photos,’ not even of the big clock. If you’d like to see a few photos taken inside and outside the museum, click here: https://skydrive.live.com/redir?resid=FCB2CF114ECC39C7!6004. We weren’t the only folks to make the schlep up the hill. For the moment, the skies were nice. When you enter, the ushers tell you ‘No photos’ and they ask you to put your cameras and cell phones away. Alas, people don’t listen. And unlike the Musee d’Orsay, where the docent just asked visitors to stop taking photos, the ushers here kick you out. No warning. If they spot you taking a photo, out you go. I must’ve seen 15-20 people get tossed. And so after 30 minutes of walking admiring the interior – and not taking a single photo – we were ready to leave. We made it out to the porch (I don’t know what else to call it) and saw that it was pouring and the wind was howling. So back inside we went. After another 30 minutes – and another 15-20 booted photographers – we tried again. 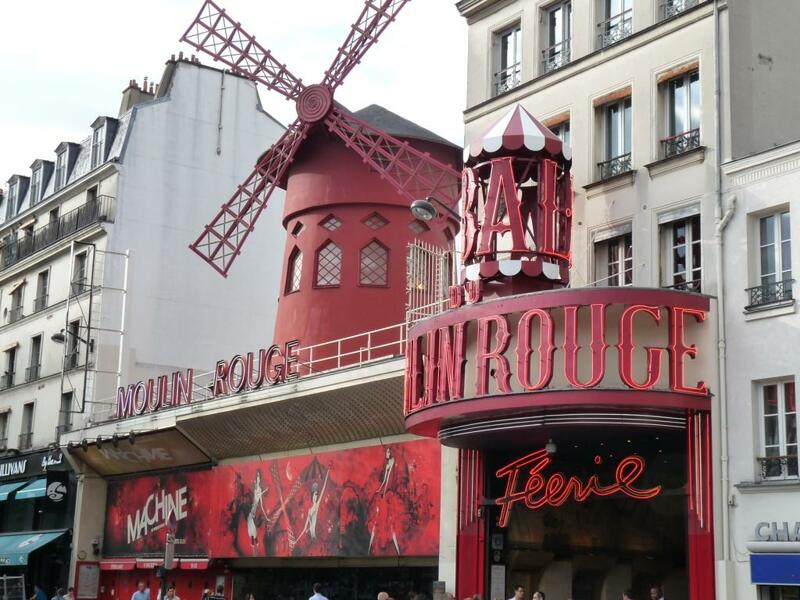 The clouds were gone and so we made our way down to the Pigalle section – the red light district – and Moulin Rouge. 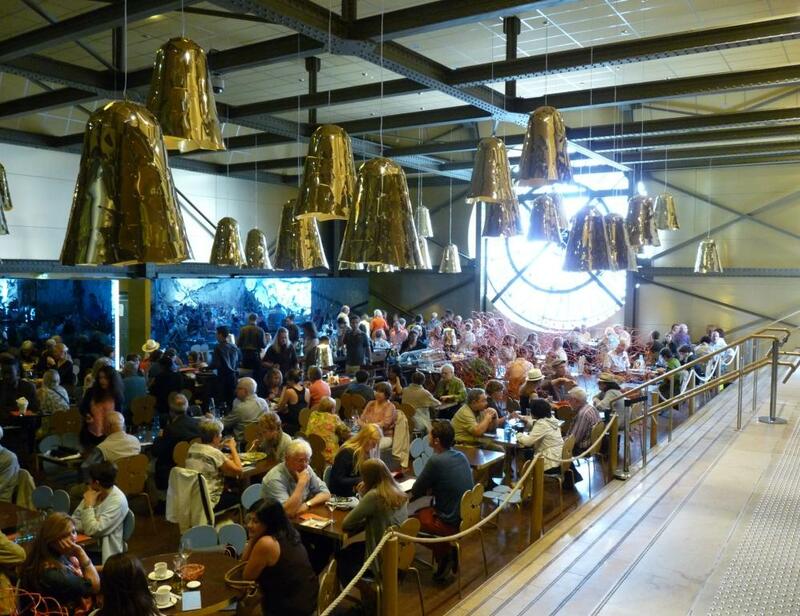 Reservations are expensive and a must if you want to see the famous CanCan girls. When another rain shower started we went inside a cafe and I had the most beautiful cappucino I’ve ever had. And it tasted as good as it looked. 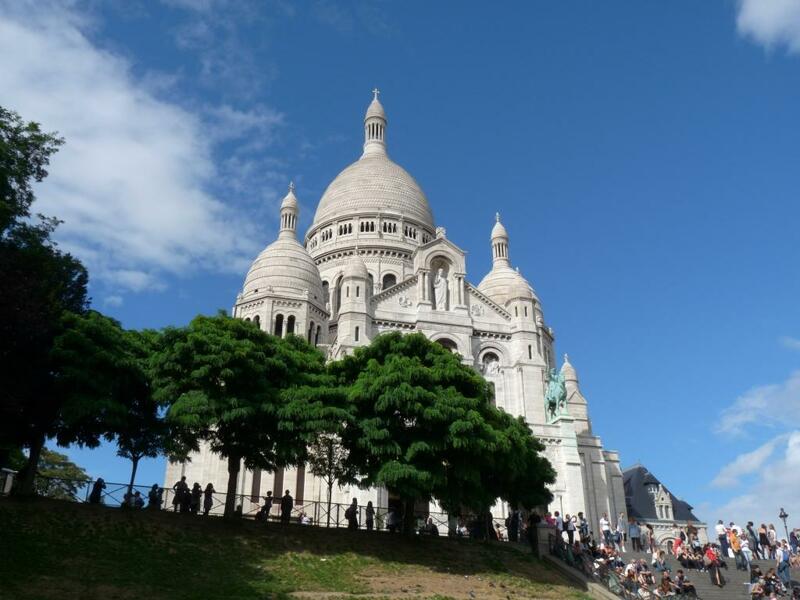 To see more exterior photos of Sacre Coeur and Montmartre, click here: https://skydrive.live.com/redir?resid=FCB2CF114ECC39C7!5973. 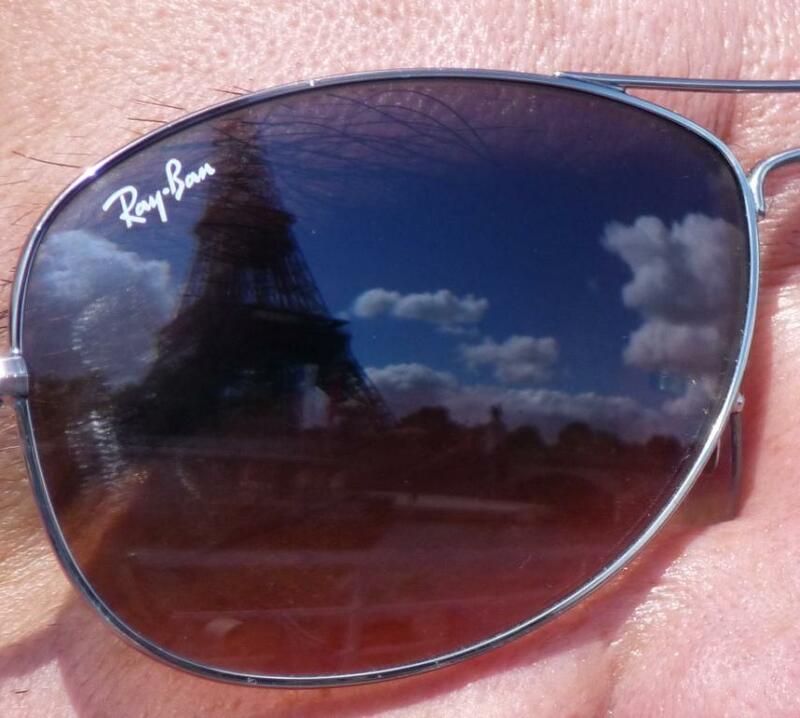 Back tomorrow with final stories and photos from the Seine and St. Chapelle. This entry was posted in Entertainment, Food and drink, Hobbies, News and politics, Organizations, Travel and tagged Bateaux Mouches, International Herald Tribune, Liberty Flame, Louvre, Montmartre, Moulin Rouge, Musee d'Orsay, Musee de la Legion d'Honneur, Notre Dame, Paris Metro, Pigalle, Princess Diana, Sacre Coeur, Statue of Liberty. Bookmark the permalink.